I’m sorry if you’re sick and you’ve been desperately waiting for the third instalment of sick person food while I was banging on about barbecues and meringue-based desserts. Hopefully, though, if you’ve got to this stage you’re so relieved to be past the worst that you’re in a good frame of mind. For stage three: the recuperation, I turn to Nigella. Always a source of comfort, I find. In fact, the ideal situation would be to have Nigella as your mum, and then you wouldn’t need to bother nursing yourself through the various stages of cold at all. This, which Nigella calls ‘my mother’s praised chicken’, is really more of a guideline than an actual recipe. I think of it as a more substantial and easy to prepare chicken soup, and it’s one of the most soothing things both to cook and to eat – it’s very good after a particularly over-indulgent phase as well as after having been ill. There’s something very healing and strengthening, whether real or imagined, about chicken stock, and this dish provides lots of it. Then there are vegetables and chicken, gently poached to a yielding state of digestibility. And rice, which I prefer to be brown. This is not exciting food, but steadying, calming fare, almost spiritually so. This is the basic recipe pretty much as written, but you can adapt it easily. Last time I made it I went down a more Oriental route, frying a garlic and ginger paste with the oil, using Shaoxing wine instead of vermouth, and coriander stalks, star anise and spring onion instead of the bouquet garni and usual stock vegetables. You will need a pan big enough to hold the whole chicken, preferably quite snugly. Un-truss the chicken, put it breast-side down and press firmly on it until the breastbone cracks and you are able to flatten it out slightly. Cut off the ankle joints using kitchen scissors or cutting in between the bones with a sharp knife. Heat the oil in the pan and brown the chicken, breast-side down, for a few minutes. Turn the chicken over and toss in its ankles. Turn up the heat and add the vermouth or wine, letting it bubble a little, then add the leeks, carrots and celery. Pour in enough cold water to just cover the chicken. Put in the garlic, bouquet garni/herbs, salt and pepper. Bring it just to the boil, then cover the pan and turn the heat as low as it will go. Cook for 1-2 hours, depending on the size of the chicken, but obviously until it’s cooked through with no pink juices. During the cooking time, prepare your rice. Divide the rice into serving bowls and spoon over ladlefuls of stock and vegetables, giving each person a portion of chicken. Sprinkle with parsley and eat with mustard and/or dill if you like. This meal gives some of the most useful leftovers it’s possible to have. The stock and meat can be separated and either frozen or used for soups, risottos, salads, sandwiches etc., in combination or alone. Or you can just keep the leftovers as is and reheat for subsequent days when you feel a bit fragile. I recently developed a minor obsession with Sichuan food. I realise I’m a little bit behind and everyone else has been all over the Fuschia Dunlop thing for ages, but bear with me: here in Oxford, we don’t have much in the way of exciting regional Chinese cuisine. Except for one place, which, to my shame, I had to rely on Giles Coren to bring to my attention. That place is Sojo, in Hythe Bridge Street, and it does a thoroughly addictive ma-po tofu. The second time I ate it, I decided I couldn’t live any longer without the wherewithal to produce it myself, and procured myself a copy of Sichuan Cookery – if you don’t own it then you should, it’s brilliant and fascinating and deservedly got voted one of the top ten cookery books of all time in the Observer recently. I digress, but anyway, perhaps it was a bit too interesting, because I got side-tracked in the first section and ended up making this chicken dish instead. You’ll probably have to go to a Chinese supermarket for some of the ingredients, but that’s part of the fun. Not sure the lady in Thong Heng Oriental Supermarket was that impressed when I dropped a full bottle of soy sauce all over her floor in excitement as I discovered more and more things I just had to pick up – oops. Maybe she would feel better if she knew that I consider it my favourite Chinese supermarket in Oxford. I stuck pretty much exactly to the recipe for my first foray, substituting cucumber for spring onion as suggested because I had one, and leaving out sesame seeds because I forgot. I wish I hadn’t, because that would have been even more delicious. If using spring onions, it’s 6-8, white bits only, and they should be slivered and refreshed in cold water rather than salted. The sauce is intended as a dressing for cold chicken, and this recipe assumes you already have some handy, but if not then the method suggested is poaching with a chunk of ginger and a couple of spring onions. I ate this with rice, but you could make a very tasty noodle salad with perhaps a few other vegetable slivers – carrots, peppers etc. Slice the cucumber thinly. Ideally you want thin strips to match the thin strips of chicken. Sprinkly lightly with salt and set aside for half an hour or so to remove excess water, then rinse and dry. To make the sauce, dissolve the sugar and salt in the soy sauce and vinegar. Gradually stir in the sesame paste, whisking out any lumps, until smooth. 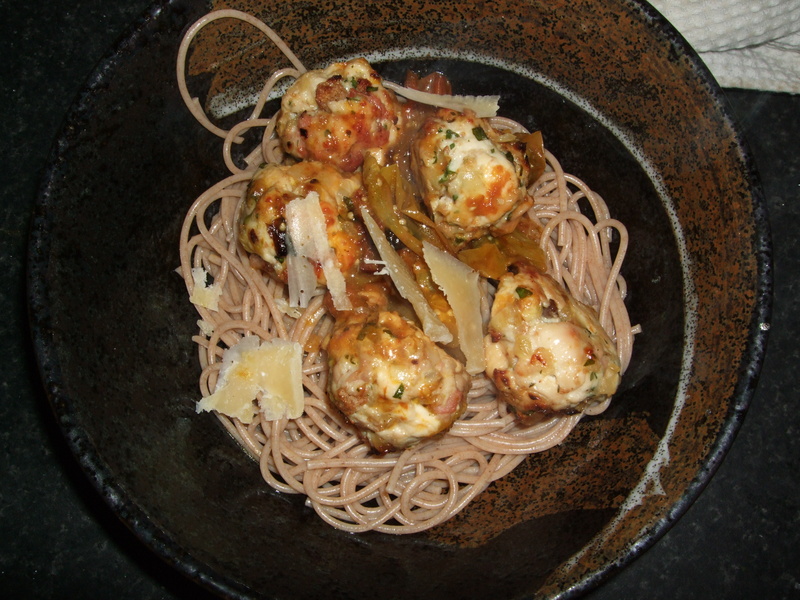 Add the remaining ingredients except the sesame seeds and mix well. To serve, pile the cucumber pieces on plates and top with shredded chicken. Pour over the sauce and garnish with the sesame seeds. 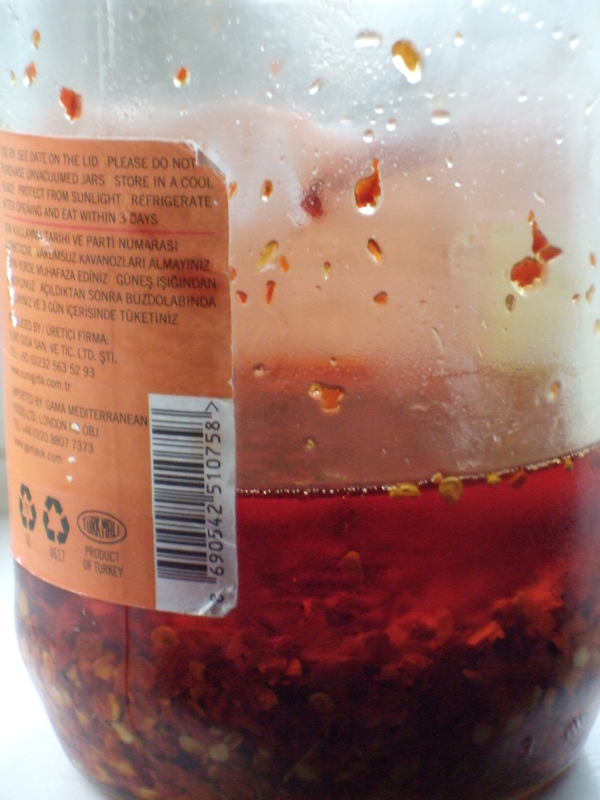 *To make your own chilli oil, put 100g chilli flakes in a glass preserving jar (at least a pint capacity). Ideally use Sichuanese chillies, otherwise generic Indian crushed chillies will do (this is what I used). Heat 550ml groundnut, corn or rapeseed oil until smoking and then allow to cool for 10 minutes. It should be at 120-130C if you have an oil thermometer. Pour onto the chillies, stir, and leave in a cool, dark place.